Warming up before you start singing is really important, and I am going to talk you through a really useful warm up exercise known as a ‘siren’ to get you started. I still use this exercise to warm up before gigs- you can get so much out of it in a few seconds! This exercise goes through all of your notes – or registers – so that they all get warmed up, and you will be able to access them better in your voice when you come to sing them in a song. To start, take a deep breath in through your mouth, allowing the air to fill your lower abdominal area and engage your diaphragm – see previous post – ‘Singing tips – Breath Control’ for more detail on this. Then hum the lowest note you can find in your voice – experiment, you may not know where this is yet. Still on the same hummed sound, gradually slide up in scale so that your voice eventually reaches it’s highest note, and then slide back down again. Don’t rush it – spend as long as you can on the slide, basically as long as your breath lasts! The whole thing should take between 15 – 25 seconds to give you an idea, although you may find yours are a bit quicker as you are getting used to them. You are aiming for a smooth, consistent sound that briefly touches upon ALL of the notes in your registers. With each siren, try to go a little higher (and possibly even a little lower) each time, so that you are really stretching your voice – but keep them gentle. You should not try to force the voice, it’s ok if it’s quiet. Warm ups are not about power or volume. If your voice cracks or cuts out at certain points in the exercise, don’t worry, just keep it gentle and these blips should iron out the more sirens you do. However, don’t overdo it – a few sirens a day is a good start, especially if you are experience areas where the voice cuts out. I would love to know how you get on with these, and do let me know if you have any questions or need a bit more advice! 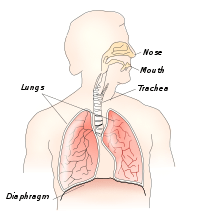 The diaphragm is flat muscle that sits just below your lungs. When you breathe in for singing, try to fill up your lower abdominal area (your belly! ), thereby engaging your diaphragm. Don’t let your chest or shoulders rise – it should just be your belly, lower back and sides expanding with the air. You are still breathing into your lungs, just lower down than you are used to, and more deeply. You could try placing one hand on your belly, and one on your chest – take a deep breath in through your mouth, and try to push the lower hand away from you as you do so. The hand on your chest should not move – your chest should barely be rising at all. Imagine the air as being heavy, filling your lungs from bottom to top. You could imagine it as having a colour, and see it filling you up from the bottom up. This process reverses when you breathe out – your belly should contract, and the hand placed on your belly should come back in towards you. Try this for a few deep breaths to really get the hang of it – you might feel a bit light headed at first as you get used to the increased oxygen intake. More proof that singing is good for you! See you soon for my next tip…or get in touch to ask a question!